The 12th annual Raatz Fence/O’Shea’s Basketball Classic saw 13 contests take place on January 25 and 26 at Mercy Academy in Louisville, Kentucky. As previously, the event (watched by approximately 20 NCAA [mostly Division 1] colleges and 9 media outlets), was sponsored by Raatz Fence Company and O’Shea’s Restaurants. It is now well passed the halfway mark in most states with post-season playoffs about to start in many. The cream of this year's crop has mostly been identified by the four national polls. In Louisville, the four teams below stood out. 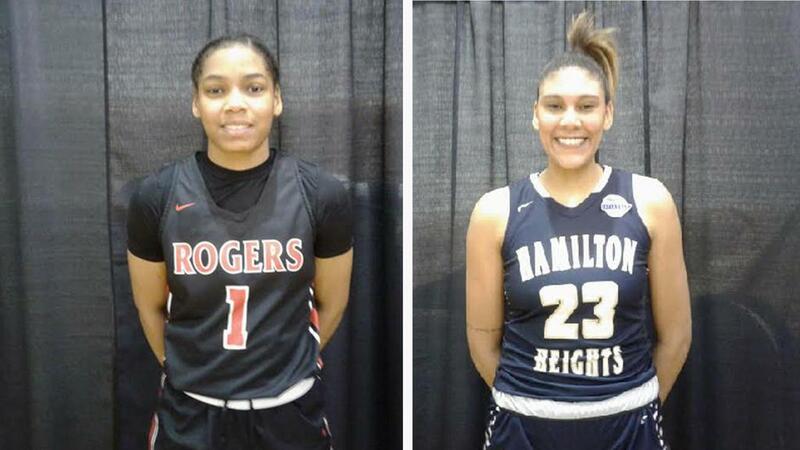 Hamilton Heights played two games at the event and won both in convincing fashion (defeating host Mercy Academy 74-32 on Friday and George Rogers Clark High School of Winchester, Kentucky, 67-50 on Saturday). Riverdale High School of Murfreesboro, Tennessee, also ranked by MaxPreps, showed very well defeating Mercy 88-50 on Saturday. St. Joseph Central Catholic High School (another team ranked by MaxPreps) of Huntington, West Virginia, triumphed over both Christian Academy (57-42) of Louisville and Butler Traditional High School of Louisville (61-47). Ranked by espnW, Incarnate Word Academy of St. Louis, Missouri, defeated Elizabethtown (KY) High School 71-57 and Eastern High School of Louisville 70-61. Looking at some of the individual talent in alphabetical order with height, position and school within graduation year. Location of school is in parenthesis. All players discussed below should be considered as prospects of some level of NCAA Division 1. Recently named a McDonald’s All-American, Cooke, a South Carolina signee, starred in Rogers two wins in totally different ways. Versus Bullitt East (Washington, Kentucky), Cooke posted 37 points and 17 rebounds in a 77-73 comeback win (down 42-25 at half). In Saturday’s 77-55 win versus Christian Academy, she posted 18 points but her seven assists really set the tone in the contest. Signed with Indiana State, Elder does a lot for her team. She shares in the ball handling dishing out assists (three in the loss to St. Joseph), scored 19 points including three triples and pulled in six rebounds with a game of power on the perimeter combined with shooting skill. Signed with Middle Tennessee, Hayes appears to have stepped up her game from last year. She competently ran the offense last season but now appears to be more confident in her stroke (11/18 from field including 3/8 from behind the arc) in posting 26 points with six assists in her team’s win over host Mercy Academy. Signed with Southern Illinois, Kinnard is a power guard who handles the ball. She looked to attack the basket (25 points) but still handed out assists (five) and collected rebounds (eight) in the loss to Incarnate Word. Signed with Auburn, Perry is a baseline operator. In her team’s 69-43 win over Sacred Heard Academy of Louisville, she posted a double-double with 14 points and 10 rebounds. Signed with Rice, Schwartz showed showed a refuse-to-lose attitude in her team’s 44-37 loss to Montini Catholic. She posted 25 points mostly attacking the basket and getting to the foul line (13/16). She also hit two three’s and collected 14 rebounds. An unsigned senior, Smith deserves a look from mid-major D1 and D2 schools. She is a decent athlete with a nice stroke playing under control. In the victory over Bullitt East, she posted 19 points including 4/6 from behind the arc. A lefty signed with DePaul, Warren has a “Steady Eddie” demeanor on the court taking what the defense gives her. She posted 35 points and handed out 14 assists in her team’s two wins in Louisville. Adkins is a combo guard who does some of everything. She backed up the point, hit the glass and scored the ball primarily via attacking the basket or getting fouled along the way. She totaled 30 points in her team’s two wins at the event. Cardosa is considered one of the top post prospects in the 2020 class and showed it in Louisville. In her team’s two wins, she posted 32 points (mostly near the rim) and 32 rebounds. An added bonus is that she is becoming a weapon as a passer chipping in eight dimes in these two contests. Hay is a smart player taking good shots. She can score via the drive or on the perimeter including beyond the arc. She posted two solid double-digit performances although her team lost both games at the event. Taylor showed well despite her team’s falling twice in Louisville. In the loss to Rogers, she posted 28 points (3 triples) and 10 rebounds and against DuPont Manuel 15 points and six boards. Hylton moved to the school from Ontario, Canada, this year and has now taken over the point guard duties allowing the wing players to concentrate on scoring. A decent athlete, she handles the ball adequately and can hit perimeter shots. Now getting Power 5 offers, Royal-Davis can score via attacking the basket or perimeter stroke. In her teams two wins, she posted 32 points and 18 rebounds. Vazzana has come a long way since last seen as a freshman. She showed improved strength and more aggressive play as compared to a year ago. She drove, demonstrated a perimeter stroke and finally a willingness to hit the glass while totaling 29 points and 13 rebounds in her team’s two wins in Louisville. Charles needs to fill out and get stronger. She impressed with a smooth baseline stroke and baseline drive to the rim. She just needs to step up and show that she can do them more than once or twice a game! Power 5 programs should be monitoring her progress. Sullivan, a lefty, was thrown into the starting slot when the senior point guard went down with a season ending knee injury. If her showing in Louisville is any indication, she will fill the role nicely going forward. Sullivan has a field general mentality with three-point stoke. Her 11 points led Montini in scoring in the 44-37 win over Ryle. Thomas is an undersized post with a good motor. She pulled in nine boards in the win over Ryle. Tyler got quality time coming off the bench for a strong Incarnate Word squad. In Louisville, it was not so much that she scored points as that she played with poise and understanding in support of her older teammates who were carrying the scoring load.